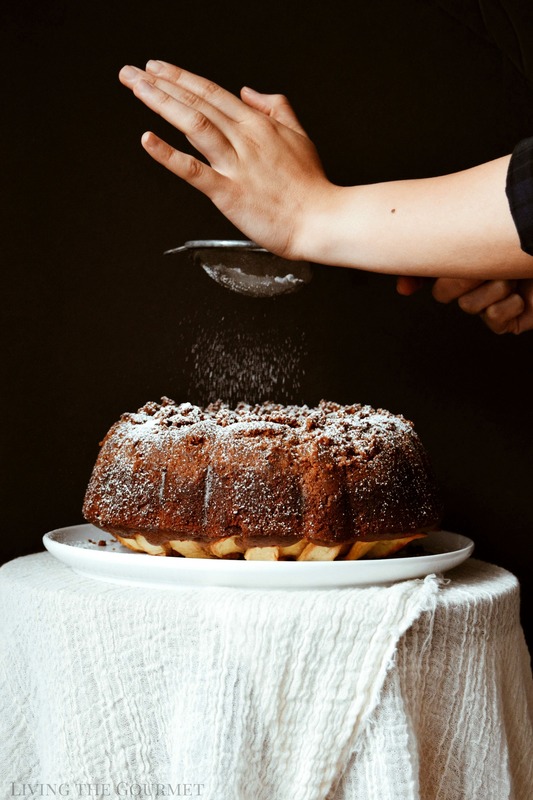 This three-layer Apple Crumb Ring Bundt boasts of brandied apples, a rich sour cream cake, and a brown butter crumb topping for the ultimate accompaniment to a hot cup of coffee. Sometimes I feel like I spend more time chasing time than living in it. I think we all feel that way, especially when the seasons are transitioning. It’s hard to believe that school is already starting up, summer is already proclaimed to be over and yes, I’ve even seen a few pumpkin spice recipes creep up into my feed. While I am looking forward to cooler days ahead, some favorite comfort foods and spiced lattes, another part of me is also sad to bid summer adieu so soon, which in New York is already short enough. The days have come and gone too quickly for me to grab and truly enjoy the season. So, perhaps I’ll get to do all that I wanted in the fall. It would seem that I’m not the only one getting on board the early fall train. 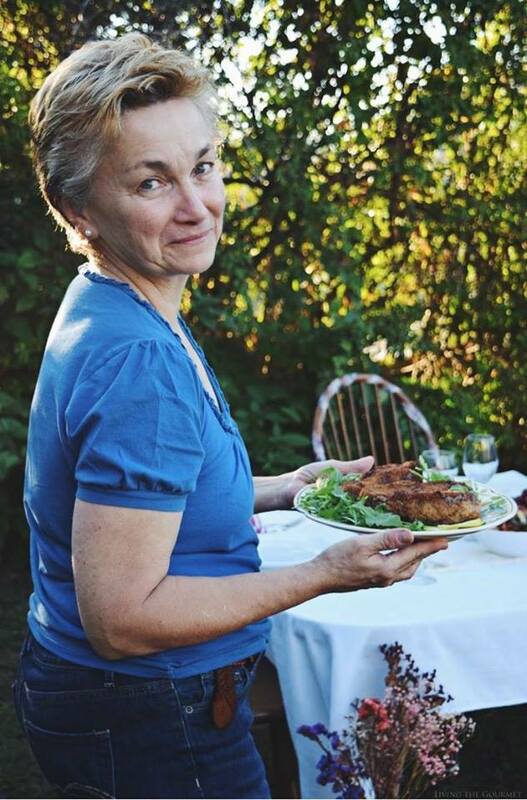 Our lovely hostess, Wendy, from A Day in the Life on the Farm chose apples for the theme of this month’s #BundtBakers. When I saw the big reveal for this month’s bake along, I got strong Autumn vibes and knew immediately what I wanted to make. Sitting with a cup of coffee and a slice of crumb cake is probably my idea of a perfect fall morning. Yes, cake for breakfast is an indulgence of mine that I especially enjoy when the weather gets cooler. 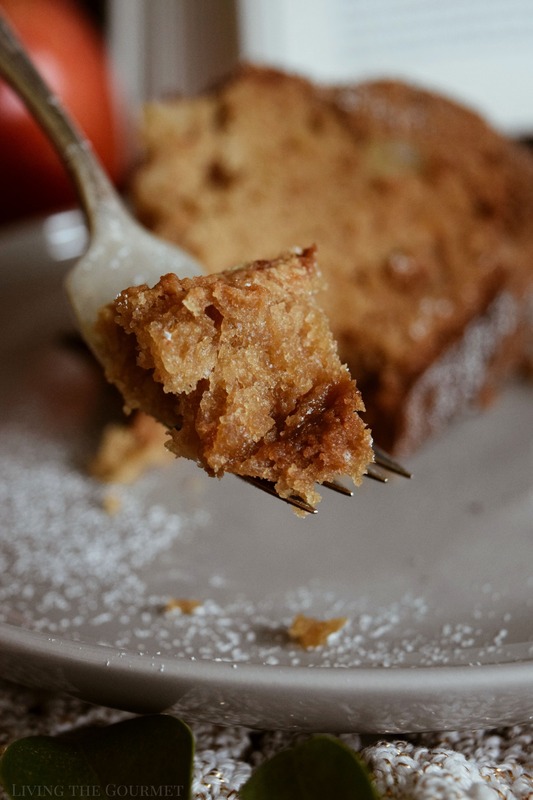 That’s not to say you can’t enjoy this cake in the afternoon or evening as well…it’s one of those sweet treats that happens to be suitable for all occasions. I tend to think of this bundt as a 3-layer cake. No, it’s not like the traditional layer cake that may come to mind, but it has three layers of texture and flavor that are all very distinct and when these layers come together, they forge one harmonious dessert. 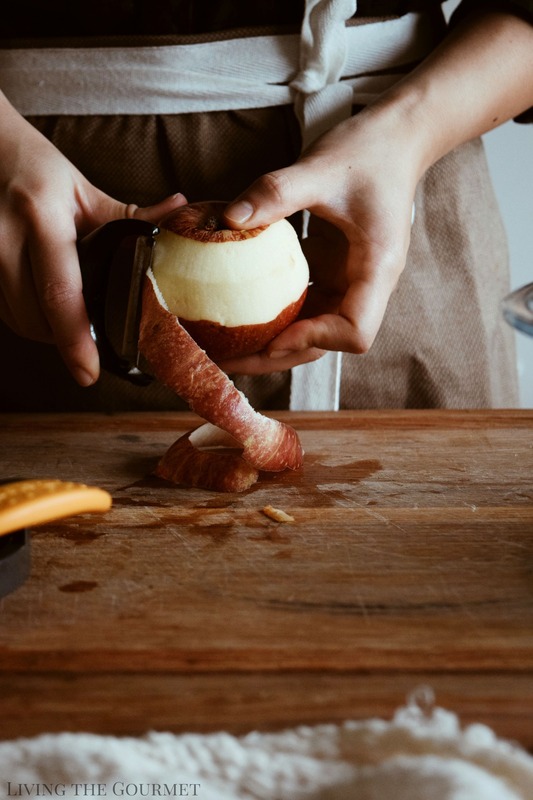 The first layer is made of thinly sliced apples that are infused with warm cinnamon and rich brandy. Some of those apples also get tossed into the cake batter, adding some depth to our cake base, which brings us to layer #2 – the sour cream cake. It’s buttery and rich but also very light thanks to some adjustments like swapping out AP flour for cake flour which ensures a more delicate texture. Then we whipped sour cream and whole milk together for a creamy addition making sure this cake wasn’t crumbly, but rather moist while retaining it’s richness. Finally, we have our third layer- the crowning glory- the brown butter crumb topping. 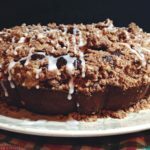 There are many variations to crumb cake but as a nod to my all-time favorite, the NY-Style Crumb Cake, I kept the crumbs big and the ratio even. The crumb layer is as thick as the cake layer- as it should be. Finish it off with a generous dusting of confectioner’s sugar and there you have it, a beautiful Apple Crumb Ring. So let me ask you this, are you sad to see summer go? Because a slice of this and a cup of coffee on a cozy fall morning is pretty hard for me to resist. Summer can pack its bags and take its humid temperatures along with it. In a medium bowl, toss the apple slices with the brandy, cinnamon, and vanilla. Store in the refrigerator until ready to use. In a small saucepan, melt the butter down and let simmer over medium heat until it has browned and is bubbling. Be careful not to burn it. In a bowl, whisk flour, sugars and baking soda. Add the brown butter and mix until large crumbs form. If the mixture looks to moist, add more flour one teaspoon at a time. Preheat oven to 350 degrees F. Grease a bundt pan and place the brown butter crumbs at the bottom of the bundt pan. Set aside. In the bowl of your mix master beat together butter, sugar, and vanilla until whipped. Add one egg in at a time, beating on low speed between each installment. Scrape the sides of the bowl. In a separate bowl, whisk flour, baking powder, baking soda and salt together. Set aside. In another separate but small bowl, whisk sour cream and milk together well. Alternate between the flour and the sour cream mixture, adding each to the beaten butter and sugar batter. Mix well between each addition, making sure there are no clumps. 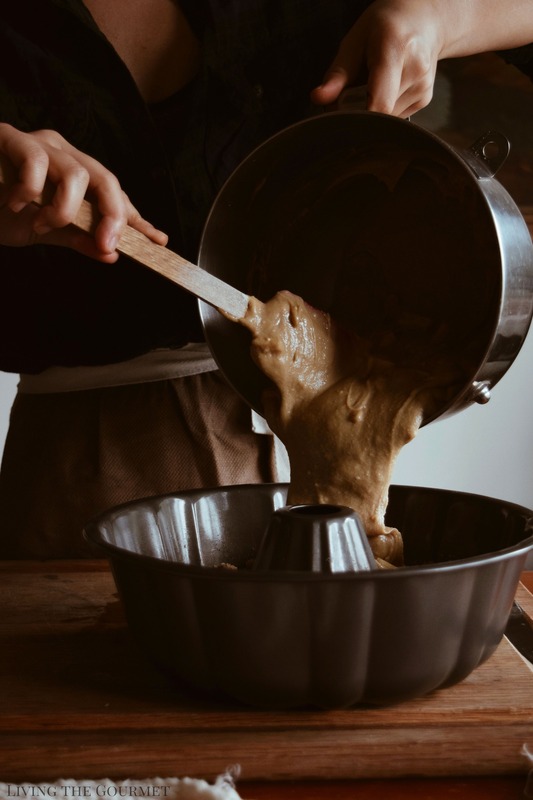 The batter should be smooth and airy. Fold ½ cup of the brandied apples, chopped, into the cake batter. 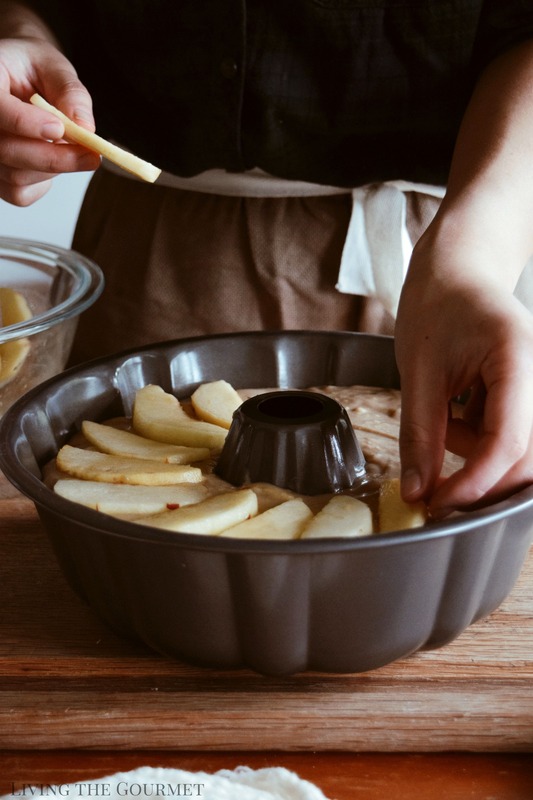 Pour the batter into the prepared bundt pan then top it off with the remaining apple slices. Bake for 35-40 minutes or until the cake tester comes out clean. Transfer to a wire rack and let the cake cool before transferring to a cake plate. Dust with confectioner's sugar before serving. I am so glad that the baking season is about to arrive here...this bundt cake looks incredible! Such gorgeous photography. I was swooning. this cake looks spectacular and the photos are over the top perfection! My morning cup of coffee (that I'm sipping right now) just started to taste lonely after reading just the first sentence of this AWESOME post! I'm full-on ready for Fall recipes, Tammy, and this is going to be one of my firsts. In fact, I think I'd better make this one tomorrow for the weekend. I love the "3-layer" factor here and I'm with you about sending summer packing. We don't get the humidity here (thankfully! ), but I'm done with 90+ degrees for weeks on end and so is my garden! Thanks for sharing this, great pictures and well written, too. Pinning for all to see! Have a great weekend. When it comes to crumbs the more the better! 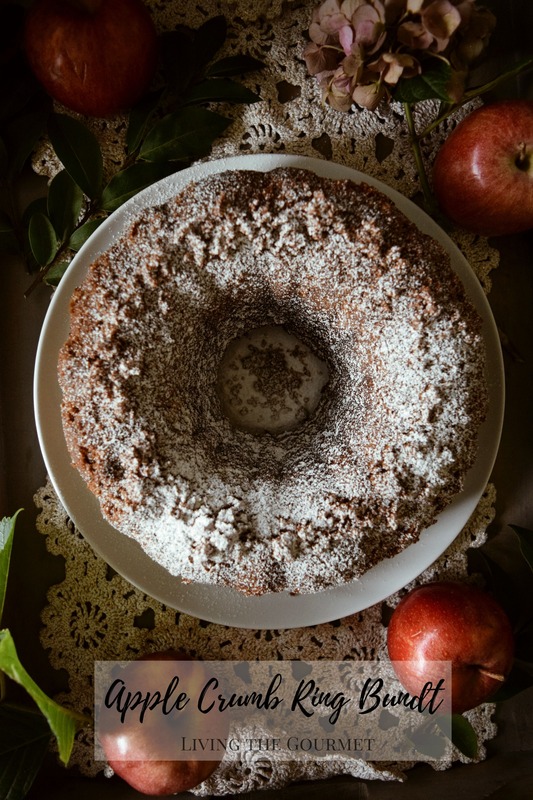 This apple crumb bundt looks terrific. I wish I could reach through the screen and try a piece right now. Such a gorgeous bundt cake! It looks so moist and tender. I do look forward to fall baking, but I'm not quite ready yet to say goodbye to summer. Though I do think that apple cake is good all year round. With apple season just around the corner, this will be the perfect dessert to make. I love bundt cakes. They are so rustic looking and don't require hours of decorating to make them look fantastic. I would eat this for breakfast too. I love cake for breakfast, too. Your cake looks beautiful, and photos are perfect. I prefer summer to winter, and why would you miss summer when you can make and eat stuff like this as you said. Your photos are amazing btw, and I love all look and sound of the 3 layers fo this amazing cake. Especially the crumb that you added. Love the images on this post, Tammy. 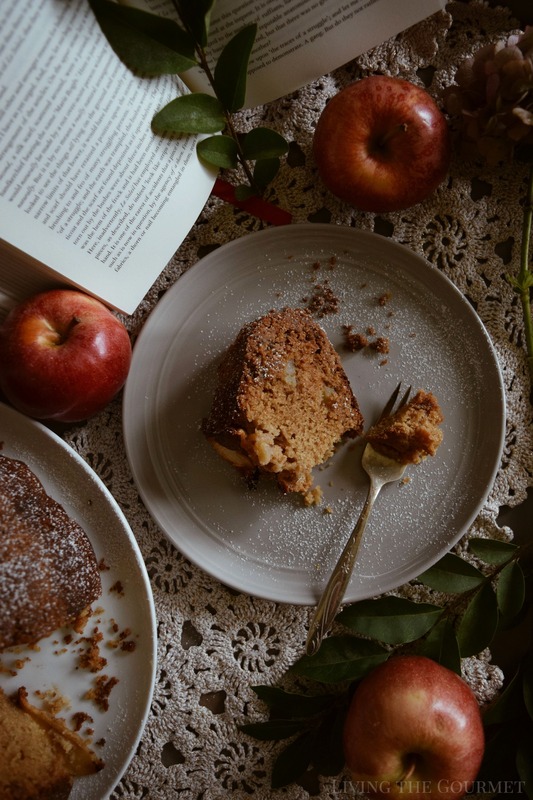 Apple will soon be in season here and I can't wait to try this cake. Sounds so good. Saving this for later. Apples are the best fall food! I love baking in a Bundt pan - everything looks so fancy when baked that way. No matter how simple the recipe, it is elegant! What a beautiful cake and I love the apple theme. Baking to me means fall, apples, and cinnamon. This is one cake that I can't wait to try. I like the idea of the brandy or rum with the apples. My mouth is watering thinking of it!! 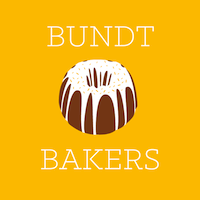 Absolutely love bundt cakes, are wonderful! and this apple crumb bundt cake looks delicious !! hugs! First of all, your photography is gorgeous! Second, this cake is making me want to buy a bundt pan ASAP!! Yum! This cake is just what I need to make it feel like fall. Here in Texas it's still really hot. And BTW, your photos are stunning. Lemme at that slice! Actually, let me at the whole bundt! This looks amazing and I need it in my life ASAP! I can never say no to apples in baked goods! Wow this apple bundt cake looks just fantastic. I love how flavorful and juicy it looks. Since I have so much apples from my grandmas garden I will use them to make this beautiful bunt cake for upcoming weekend. Thanks for the recipe. Oh my goodness, so yummy! And your photography is gorgeous. I'll have to try my hand at this bundt cake, fingers crossed it comes out as beautiful as yours. This apple crumb bundt cake looks delicious and moist. I haven't started any fall baking.Still holding on to summer peaches. Beautiful cake love the brown butter crumb. Beautiful cake, love the brown butter crumb. 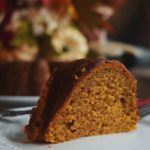 I love a good bundt cake and this one sounds perfect for fall! Your pictures are gorgeous too - I wanna reach through my screen and grab a big piece! You had me at crumbs. I can't wait to make this cake and I love the journey you took me on with the photos. Beautiful photography! and since Apples are in abundance this is going to be on my list! This looks fantastic - so perfect for fall! Pinning for later!! This is GORGEOUS. I'm absolutely dying for fall to arrive so I can make all things apple! 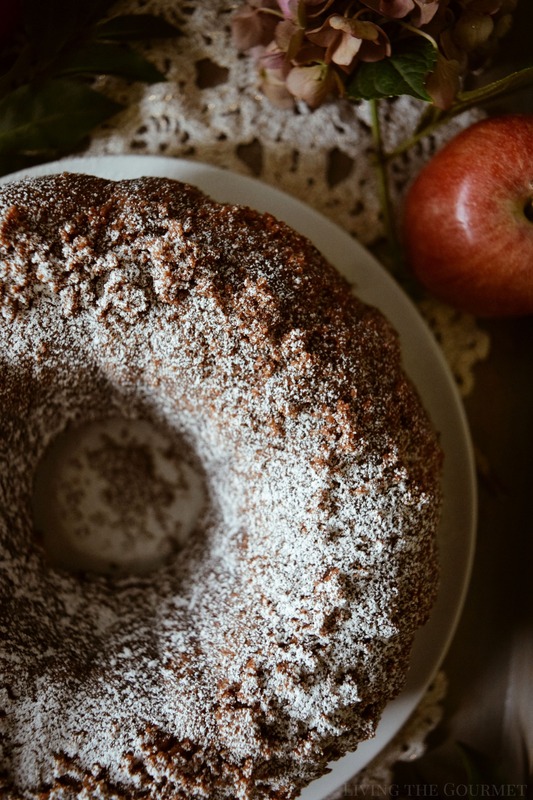 This apple bundt cake is giving me all the Fall foodie feels. This cake would be perfect for the upcoming holidays. Can't wait to try this recipe out! This bundt cake looks amazingly moist! And its perfect for my weekends on the couch with a cup of coffee. Bookmarking this one! Yum! What a gorgeous looking cake!! This is going to be a hit in our home this fall. 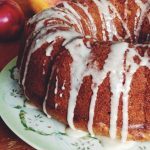 My all time favorite cake is an apple bundt cake - so I am sure this is right up my alley. Can't wait to give this recipe a try! Your photos are stunning! This might be the most gorgeous apple cake I've ever seen. I am definitely making this cake for Fall. It looks incredible! !